1.1 After upgrading i still have the previous installed Firmware, why ? 1.2 The Webgui has no red Border at the right site, is that a bug ? 1.3 When i press "Add" nothing happens, why? 1.10 Which Framing Setting (regarding CRC-4) does the beroFix E1 Lineinterfaces have ? 1.11 Why is my Callerid "berofix"/ or the SIP Authentication Name instead of the real ISDN Callerid ? 1.12 How do I downgrade from a Firmware > 1.13 to 1.12 or below ? 1.13 How do i use CLIR with beroFix? 1.14 What do the clock sources and master/slave settings mean? 1.16 Why do I have phantom Ringing on an FXO Line ? 1.17 What's the Content of the beroFix CDR? 4.1 Why can't I use My analog Phone or why does my Gateway reboots endlessly? After upgrading i still have the previous installed Firmware, why ? beroFix hast a seperate upload and install mechanism, you might have forgotten to press the install link after the firmware has been uploaded. beroFix has 2 Slots for installed Firmware Versions, so you can upload 2 Versions and activate one of them, this makes it possible to go back to a running state if the new firmware does not work as expected. You can check the installed firmware Version either in the update-tool or on the Management->Info Page. The Webgui has no red Border at the right site, is that a bug ? This is not a bug, it is intended to look like this. When i press "Add" nothing happens, why? You have most probably blocked pop-ups. The beroFix GUI has several configuration options in pop-ups. To detect the berofix device the bfdetect tool sends a Broadcast packet to the network. If you have installed a berofix card in your system you have at least more then one network device. In this case you have to start bfdetect with an argument (the IP-Address of the network device) where bfdetect should send out the broadcast message. For instance if berofix is eth4 with ip-address 10.0.0.1 you have to start bfdetect like this "bfdetect 10.0.0.1". If you use berofix together with a asterisk 1.6. please set ignoresdpversion=yes in the sip.conf. Otherwise you will get an Hangup after the connect on Outbound ISDN Calls. Depending on the Type of Number settings of the Telco on point to point lines, it is possible that the callerid will not be displayed correctly on outbound calls. Please read the Type of Number Note for further infos. It seams to be not easy to explain how many channels a berofix card can handle. Please have a look to the berofix Channel densities Note for more informations. We provide a tool called bfdetect which can be downloaded in the "Support/Download" section. bfdetect is able to detect berofix devices in the network also if you lost or forgot your password. See the corresponding section in the documentation howto use bfdetect. Which Framing Setting (regarding CRC-4) does the beroFix E1 Lineinterfaces have ? Currently CRC-4 Framing is on by default, it is not yet possible to modify this setting in the 1.x Firmware Releases. Why is my Callerid "berofix"/ or the SIP Authentication Name instead of the real ISDN Callerid ? ISDN and SIP have different Callerid Fields. berofix needs to put it's possible 3 callerids somehow into the SIP Fields and vice versa. Obviously the best way is to put the oad into the from_user to make sure that most PBXes including Asterisk get the callerid in the right SIP Field. But there are certain circumstances when berofix cannot put the oad in the from_user field. E.g. when beroFix needs to register and authenticate itself at the PBX, then beroFix needs to use the authentication username as from_user. beroFix puts it's oad then into the displayname. The Solution to this problem is either tell the PBX to use the displayname as callerid or to not register beroFix with the PBX and instead use the "proxy" setting in the berofix settings. In this case berofix can safely put it's oad into the from_user and nothing needs to be changed at the pbx site. Please read Config String or "more" options for more details. How do I downgrade from a Firmware > 1.13 to 1.12 or below ? Since the 1.13 release Candidates we have a security Mechanism in the Firmware Update Process to avoid installing of potentially corrupt Firmware images. Since 1.12 and Firmware below did not have this mechanism you can not simply downgrade. If you still need to downgrade you must rename the Firmware Image to contain the word "downgrade". So for example if you want to install appfs-1.12.tar.gz you must rename it to appfs-1.12-downgrade.tar.gz. This overrides the security mechanism. How do i use CLIR with beroFix? There is a simple way to use CLIR with specific calls. Just set the Value "CLIR on SIP" in the berofix GUI under "SIP->SIP" in the SIP Entries under "more". If you set "CLIR on SIP" = "anon" then you can simply send a Call with the Callerid "anon" to berofix and beroFix will set CLIR on the ISDN Lines. What do the clock sources and master/slave settings mean? Berofix has 2 Line Interface slots. The maximum number of ISDN BRI Ports is 8 (2x 4BRI) and the maximum number of ISDN PRI Ports is 4 (2x 2PRI). It is very important to define the ISDN timing source properly to prevent bit slipping and jitter between berofix and the ISDN Network, which can cause damaged Faxes or even CRC-Errors and therefore Link-faults. The timing source can be configured via the clock setting in the Webgui. It can be found in the "Hardware" menu. In most cases berofix should be configured to have just 1 Master Lineinterface module and a second slave module. The master module should have a clock source which is actually connected to an ISDN Port of the ISDN Network. This FAQ handles the problem that there is no "Ringing", when redirecting incomming ISDN calls over the 3CX back to ISDN again. Please have a look to the No_Ringing_Redirect_3CX Note for more informations. Why do I have phantom Ringing on an FXO Line ? The FXO Module detects a Ringing on the Line depending on the Minimum and Maximum Peak Voltage during a Ring Burst. These 2 Values differ in different countries, so the Country Setting in the GUI in "Hardware" must be set correctly. The default value is "FCC", especially in germany it must be changed to "1TR110_DE"
What's the Content of the beroFix CDR? The berofix CDR contains comma seperated fields which summarize every call. 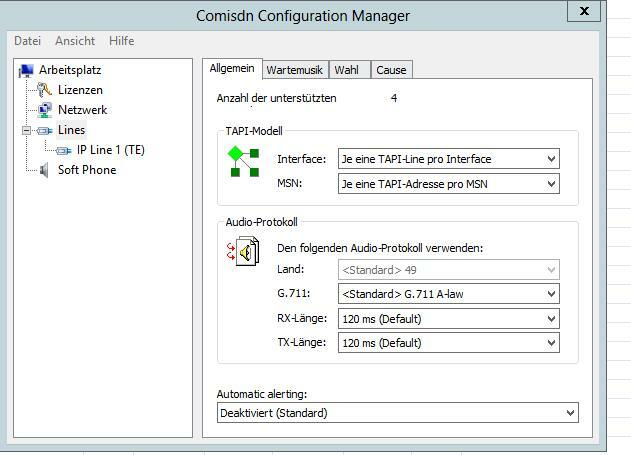 beroFix allows to change the Type of Number via the "onumplan" advanced Settings, either in the Dialplan in a SIP->ISDN direction or in the ISDN Group. The definition is made by berofix at an outbound call (to ISDN), which means that the Number itself must have the correct Format. Note: that we ommit any prefixes like 0 or 00 or + in the national and international formats! Gemeinschaft 4/Freeswitch is changing the SIP Status 180 to 183. BeroFix maps a 180 to an Alerting ISDN message and an 183 to a Progress ISDN Message. Only the Alerting ISDN Message creates the ringback tone. / Gemeinschaft 4/Freeswitch ändert den SIP Status 180 auf ein 183. Berofix übersetzt ein 180 in eine Alerting ISDN Nachricht und ein 183 in eine Progress ISDN Nachricht. Nur die Alerting Nachricht erzeugt im Amt den Klingelton. NOTE: I2S Call Progress Tables can only be created with the firmware 2.2rc5 and newer. More info on BeroFix Call Progress Tables. ACHTUNG: I2S Call Progress Tabellen können erst ab Firmware 2.2rc5 erstellt werden. Mehr Informationen zu BeroFix Call Progress Tables. If you ever encounter issues like: random call drops, bad voice quality, Echo or such, you should check our Known Issues page. KEYBOARDTYPE="sun|pc", where sun means a Sun keyboard is attached on /dev/kbd, or pc means a PS/2 keyboard connected to a PS/2 port. KEYTABLE="<file>", where <file> is the name of a keytable file e.g. 'en_US','en_GB' or 'de-latin1-nodeadkeys'. There is an additional configuration option that can be used in the dialplan and in the sip account, which modifies the berofix t38 behaviour. More details can be found here. If the beroNet Gateway doesn't respond to network requests (even not to Ping) anymore, but doesn't reboot automatically and the ISDN or Analog LEDs are still lit, then it might be that a broken Ethernet broadcast package has killed the Network Stack of the DSP. These packages are often created by MS Hyper-V Systems (not by all). If the destination is another beroNet gateway, it needs a dialplan rule from SIP to ISDN (or Analog) with the same additional configuration option. It is important that the SIP codec is set to alaw/pcma in the SIP account. After update repectively downgrade you have to set the password again. Open the Berofix Web-GUI --> Preferences --> Security. Type your old password and set a new password or use the old one and confirm it. In Firmware < 3.X there was a Bug in the FXS driver causing a reboot during the Boot-Up-Phase if an Analog Device was connected and in OFFHOOK state. This should be fixed in Firmware 3.X. The best approach is to unplug all devices and then do the firmware upgrade. If the SSD is bigger than 30GB the partition has to be resized. In order to do that open Control Panel and navigate to System and Security. 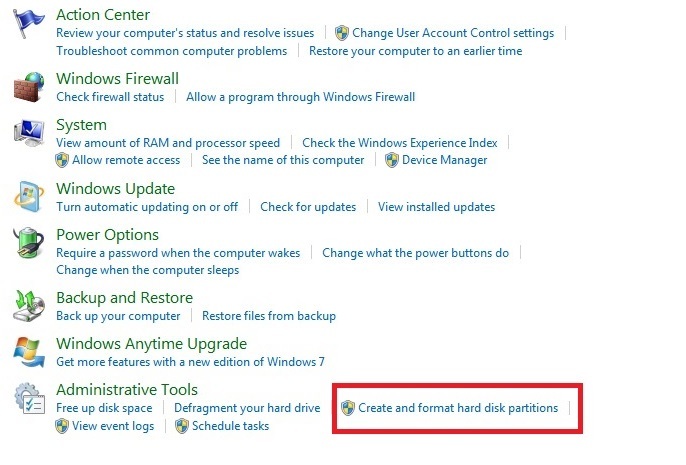 Below the Administrative Tools menu select "Create and format hard disk partitions". 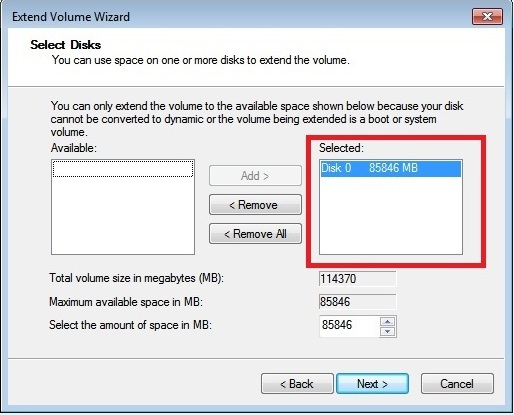 After the SSD has been detected just right-click on it (Usually it is "C:") and select "Extend Volume" from the menu. A Extend Volume Wizard will show up and proceed with "Next". In the Extend dialog, you have to enter the size you want to extend. The system does automatically recommend the maximum space to extend. 4. Go through the numbered subkeys until you find one that matches your network adapter configuration. 5. Modify the value named NetworkAddress to reflect the desired MAC address, but without hyphens/colons, if you want 00-B3-A0-03-00-1F, set the value to 00B3A003001F. beroCAPI (both old and new versions) currently support registering with a single Berofix. Why can't I use My analog Phone or why does my Gateway reboots endlessly? beroNet Gateways have a special Port-Pinout for each RJ45 Port. In case you connect 2 beroNet devices together - like in the Starterpack Scenario - it is necessary to use only a 4 Pin cable, like the orange one which is shipped with the startarpack. This page was last modified on 16 September 2016, at 09:44.